This week Ian from London Unveiled reveals one of London’s lesser known but wonderful landmarks. Many visitors to London visit the typical top tourist attractions, whether it be viewing Parliament, visiting Madame Tussaud’s or riding on the London Eye. But London has much more to offer for those who are willing to go beyond the customary sights. In my opinion London is at its best when a visitor experiences something they find – a hidden courtyard, a Christopher Wren church other than St. Paul’s, or a unique historic place. 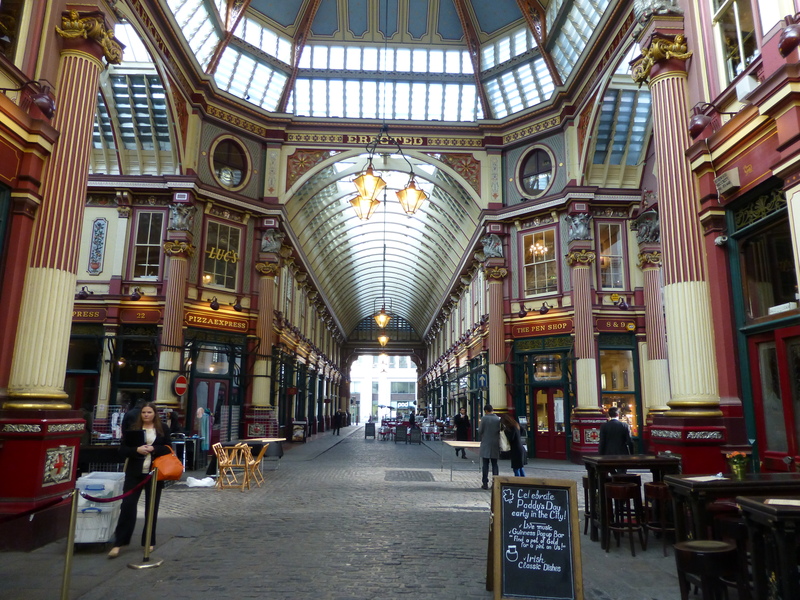 Leadenhall Market is one such place. While it may be listed in many guide books it is often further down the list and thus many visitors never experience this wonderful location. Conversations with many visitors to London and locals alike has convinced me that it is still one of London’s lesser known places, despite being a true historical gem. If you haven’t been here, put it on your must-see list. If you are interested in other places “off the beaten path” in London, then consider visiting our website LondonUnveiled.com. 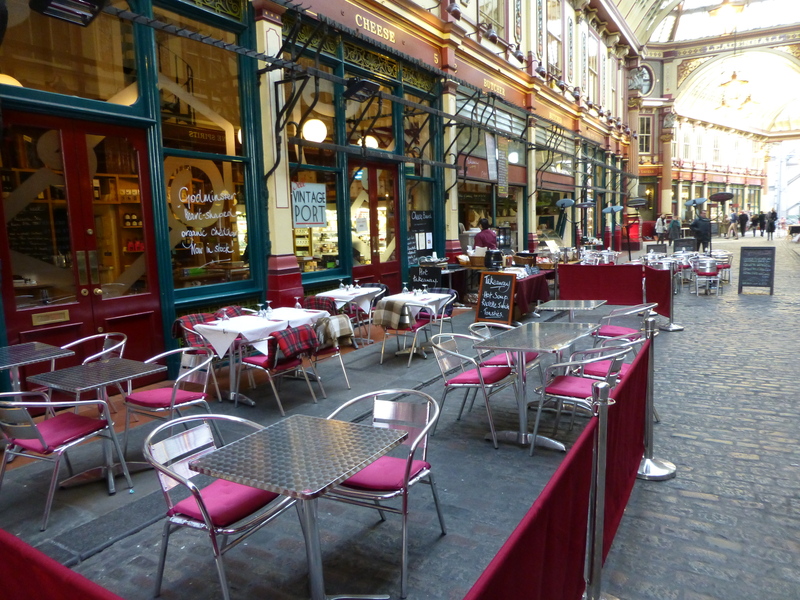 History: Leadenhall Market dates back to the 14th century and is situated in what was the centre of Roman London. In Roman times this was the site of a forum, which contained a basilica. The original forum was built about 30 years after Londinium was founded (around 71 and 85 AD). It was later replaced (around 100 – 130 AD) by a much larger forum – covering over 2 hectares. The basilica in this forum was the largest Roman building north of the Alps. It housed offices and administrators for the governance of London. Its size (52 by 167 meters or 172 by 547 ft) made it larger than St. Paul’s. Remnants of the Basilica were discovered during the construction of the current Leadenhall Market in 1881. The market goes back to the 14th century. It was first mentioned in 1345 as the place where foreigners (i.e. non-Londoners) were allowed to sell poultry. This market was held in the courtyard of a building known as La Ledene Hall, a 13th century mansion with a lead roof. The market expanded over time to include cheese and other food products. The structure was rebuilt once before the Great Fire. After the Great Fire of 1666 the affected structure was rebuilt as a covered market. The ornate Victorian structure there today was designed by Sir Horace Jones and built in 1881 and is a Grade II* Listed building. If you have been to the Galleria in Milan, which was built 20 years earlier, it seems likely that Jones was influenced by it. Jones also designed Smithfield Market and the original Billingsgate Market. In the early 1990s the structure was restored to reflect its original paint colours. With its glass roof, vibrant colours and cobblestone floor, it is a unique destination. 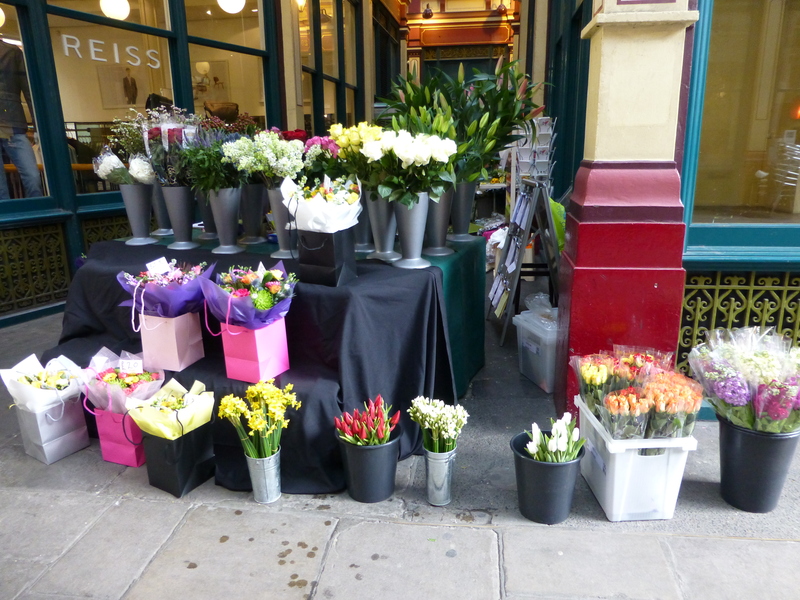 Today: There is a wide range of restaurants, food shops, florists, and retail businesses. To fully soak in the ambiance of the building, take a break at one of the restaurants with outdoor (covered) seating. One great visual contrast can be seen at the eastern entrance where the ‘inside-out’ Lloyd’s Bank building stands. Films: Many TV shows and films have used this site as a location for filming. Harry Potter and the Philosopher’s (Sorcerer’s) Stone is one of the more well known films partly shot here. In addition, it was seen on TV during the 2012 London Olympics as the Marathon ran through here. Hours: While the building is open 24 hours a day, the core trading hours are 10-5 Mon-Fri. Closest Tube: Liverpool Street or Monument. Not sure if you’ve seen it yet, but I sent you an email. Thanks a million for the support, Jo!